Snipes is a Democrat that was appointed in 2003 by Jeb Bush to replace Miriam Oliphant who was escorted from her office due to having uncounted ballots in her possession. Snipes has since been reelected to her position since that time. Snipes was reelected in 2004, 2008, 2012 and 2016. It is common to replace a person that has been removed from office for whatever reason with one from the same party. The Secretary of State is the person in charge of elections and the current one is a Republican, appointed by a Republican. That was the point of my question. Yeah how about that. 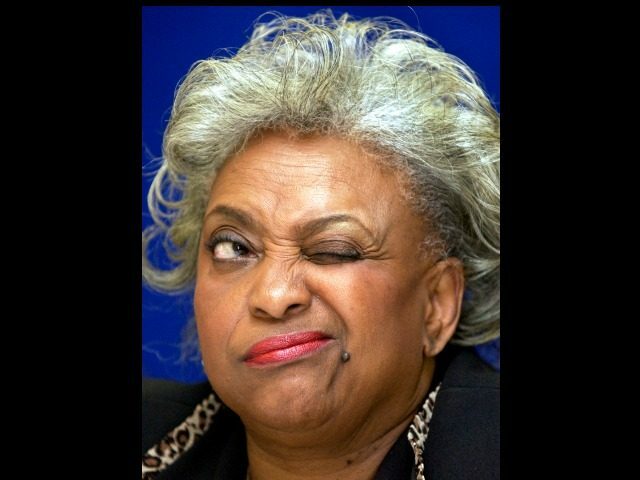 Snipes was caught illegally destroying ballots in the 2016 election. She actually admitted in court under video oath that she knows for sure that illegals and dead people vote in her dustrict. How does she still have her $127,000 a year job? Saw this on tumblr. Everything makes sense now if this is true. Scott's lawsuit seems to have gotten a Federal judge on the case. Surely there are rules about time limits and ballots that appear mysteriously after being outside the chain of custody. When a candidate is ahead by nearly 70,000 votes with 98% of precincts reporting then 4 days later he's only ahead by 15000, someone is cheating. 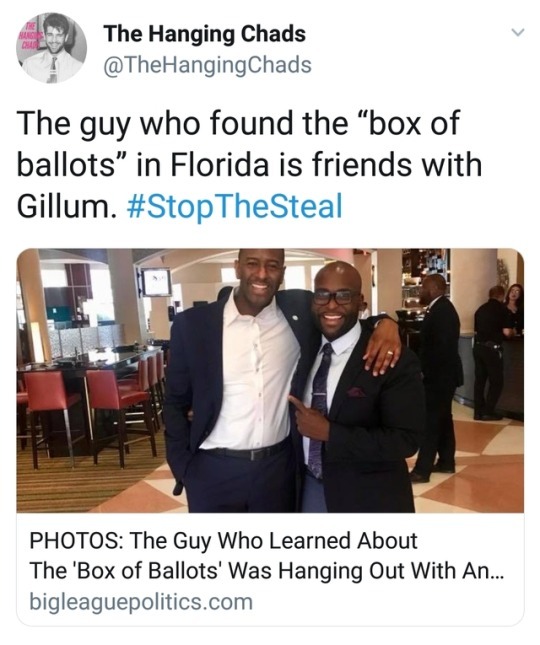 So Gillum calls for that “every vote should be counted”! Republicans would agree but also make sure that each vote is counted only once. And make sure they are legal votes. It doesn’t take much to see the chicanery going on from the DNC. Before this is all done a jury will be “voting on every count” and which ones they are guilty of. They found enough votes to force a recount, imagine that. There is zero proof of any chicanery. All that exists are accusations and a lawsuit that we know is frivolous because they had no concrete accusations to present to the police when asked. There is zero proof of any chicanery. 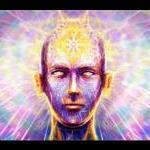 Do you think trying to insult our intelligences really works? You’re deflecting from the truth. What does this have to do with anything? There are always reasons to appoint someone of the opposition party into some position. That doesn’t somehow prevent that person from doing something corrupt. Yes, nothing says utterly chicaneryless as “we have tallied the voters, there were X number of votes cast in total” followed by “OHH HEELLO .... a bunch of new votes were found that got lost. And they’re all for the one party”. I reiterate - it is not difficult to tally the total number of people who voted within hours if not minutes of the ballots closing. They will already have the number of postal votes sent out for each electorate. Thousands of votes appearing out of nowhere is, politely, mysterious. I'm presenting the truth as it is known. You're the one who's parroting accusations with no proof or even evidence. It means that they already have someone in position to oversee the election. And considering they offered no evidence to the police, they obviously know of no actual examples of voter fraud. The only reason for these baseless accusations is because the votes that were still being counted were in heavily Democrat areas, which is also the reason Dem votes increased. And you should be made aware that Republican votes also increased, just by less than Democrat votes. If you don't know this then you obviously haven't even read any articles on this other than the accusations themselves. We'll see what the recount shows, but at this moment in time there is no evidence of voter fraud. This is the reality of the situation. a bunch of new votes were found that got lost. And they’re all for the one party”. That's simply not true. The uncounted votes were in a Dem area and votes for both candidates increased as they were being counted. This was all watched closely in real time. Everyone saw this unfold, except, it seems, some conservatives. reiterate - it is not difficult to tally the total number of people who voted within hours if not minutes of the ballots closing. They will already have the number of postal votes sent out for each electorate. Some states have a deadline of Wednesday the next week to account for all votes. Your statement simply isn't true. WHY cannot the votes be counted on the night? It's not true. In the Senate race, both Republican Rick Scott and Democrat Bill Nelson have seen their vote totals consistently increase since Tuesday night — by tens of thousands, actually. Ditto in the governor's race between Republican Ron DeSantis and Democrat Andrew Gillum. However, Nelson and Gillum have added more votes than Scott and DeSantis, respectively, which is why the races have narrowed. That's to be expected, since the majority of the votes counted in the past two days or so are in two counties — Palm Beach and Broward — are heavily Democratic. Trump's tweet includes another conspiracy: that the votes counted since Tuesday night in South Florida were "found." There is no evidence Broward and Palm Beach counties are counting "found" or fraudulent ballots. Rather, officials say, they are counting to tally the votes their offices received by election day. The accusations are complete bull****. But you guys are free to go on believing whatever you want. Conspiracy theorist Republicans usually do. Because they obviously need more time. Absentee ballots, posted ballots, whatever. Outside of a close race these might not matter, but in a tight one every vote counts. You don't seem to get it. It's not that it takes time to count uncounted ballots. It's that new, unaccounted for ballots appeared the next day, well past the 30 minute deadline to account for all votes casted (not counted). Even if they were misplaced, there should have been a tally of them. Then there is the chain of custody which is in question. Don't deflect with those votes not counted yet. These silly old tactics just don't fly anymore. But that doesn’t make sense! Computer ballots automatically tally votes. No need to count them, the results are instant. paper ballots come out of a book of ballots. The Book has a finite number of ballots. You subtract the number of ballot papers you have from the number you started with and voila you have the number you gave out. You tell the person overseeing the election in your polling booth and there you go, thr number of paper ballots handed out in that booth. thr overseer sends that number to a central hub. There you go, all thr votes for one district. its not bloody rocket surgery. Once upon a time where the fastest means of transport was the horse you might have needed two weeks to tally all the votes. You should within an hour of the polls closing know how many people voted. Now, it might take time to tally up the individual votes as to each person on the ballot, sure. But not know how many people voted. That polling district has a record of unethical voting habits, but this time it is a legitimate, so Republicans don't have a clue what they are talking about. Where has it been shown that more votes were appearing? As far as I can tell, it's only votes that have already been cast that are now being tallied. That was a baseless accusation from the Republican which when asked by the police what evidence he had, he said he had none. It was nonsense. The governor also said he has asked the Florida Department of Law Enforcement to look into potential fraud. The department and the secretary of state, both agencies Scott oversees as governor, have both previously said there is no evidence of fraud. And here we are nearly 50 posts later and people still think, without any evidence, that magical votes are appearing. His own police and secretary of state have stated there is 'no evidence of fraud'. Really? Where is the evidence of this and why has his own secretary of state and police department stated that there is no evidence of voter fraud? (CNN) The elections board in Florida's Miami-Dade County has collected a set of mysterious ballots in the Opa-locka mail facility after Democrats raised concern about the uncounted votes. The uncounted ballots have emerged as one of many battles over the fiercely contested Florida elections that moved this weekend into a recount phase. Suzy Trutie, a spokesperson for the county's supervisor of elections, told CNN there were 266 ballots in the shipment and that the votes will not be counted. Florida law requires all ballots sent by mail to arrive at the election facility by 7 p.m. on Election Day, and these ballots did not meet that standard, Trutie said. “Found ballots” suggests that somehow, somewhere these votes appeared. Not “after a search for lost ballots”, just “found ballots”. Now, given that it’s bloody easy to know the number of votes cast, than should ballots be missing it would have been obvious. EMM I've noticed you're on pretty much every us politics thread but are based in the UK. Have you been state side or spent any extended time there? There are no 'found' ballots. I just posted an article above that shows you what happens if ballots are found after the deadline. Surprise: they're not valid.